Sticks are fun too! 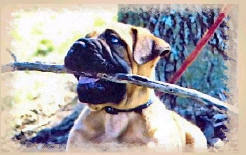 BluffCreek's Mighty Quinn is owned by Kelli Johnsen of MoKan Bullmastiff Rescue. This photo was taken by Jennifer Lane.